Collinsville's defense held Skiatook out of the endzone from the 2 yard line on 4th down with 1:41 before the half. 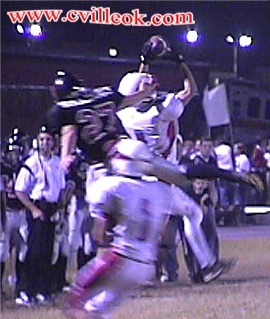 The Cards could not move the ball and Adam Thomas had to punt from the backline of the endzone (above). Cody Brown intercepted a Skiatook pass on their next series and kept Collinsville within 6 at the half. This play came near the end of the 3rd quarter with Skiatook driving for their final touchdown scored at 10:31 in the 4th quarter.